We were backpacking through Sumatra for more than a month when our journey came to a sudden turning point. Idul Fitri, the biggest Muslim holiday, was just around the corner and we were told that Indonesia’s transportation system was about to collapse. The clock on our 2 month visa was already half way down and to avoid the risk of getting stuck, we had to make a quick decision to leave Sumatra and head for Java. 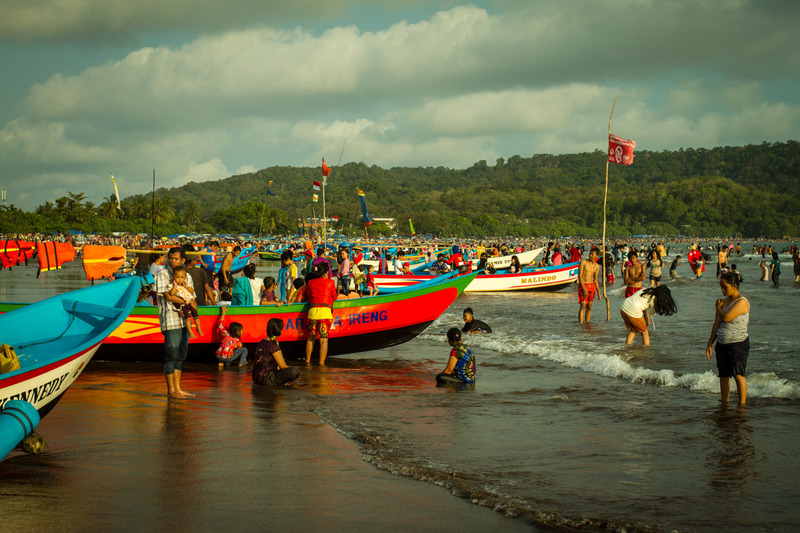 We decided to follow the local trend and set off for the small fishing village of Pangandaran to recover from our intense travels. Backpacking can be a challenge, less for Nico, all the more for me. With 15-18 kilos on my back, endless distances that need to be overcome at up to 40 degrees heat, countless sleepless nights in buses, trains and other means of transport, cooped up sitting between smelly people (myself included), I was close to hug and kiss the people when we finally arrived. Taking into account that my last shower happened days ago, I changed my mind for the good of all. We arrived after midnight and the celebration of Idul Fitri was well underway. As usual we didn’t book any accommodation in advance, which might have been a smart move in this case. We hired two becaks, little bike taxis fitting one person and a backpack, to take us downtown. The streets were filled with people firing self-made bazookas at us and we felt like driving through a war zone. The noise was horrible loud. At that moment I didn’t know they were only shooting hot air. I was really scared and unfortunately it took more than two hours to find a place to stay the night. A long our way we discovered a to us unknown business branch which enjoyed great popularity among the crowd: rental disco-bicycle-buggies. At least that’s how I call them. They light up and flash in the most lurid colors and kitschy motifs. Everything was represented, from Hello Kitty to Heavy Metal. There were hundreds of blinking buggies rushing through the streets, which resulted in multiple traffic jams. As if that was not enough, they were equipped with the largest jukeboxes I have ever seen. The size of the speakers seemed to be a key sales argument. The holidaymakers were riding, laughing, screaming and singing on their buggies all around the town. One song from the charts by another was played on the highest volume on each single buggy, not only that night but during the whole festival. I have to admit, without beeing on site, I would have had no clue that Idul Fitri is the biggest and most important festival of the Muslims. It heralds the end of Ramadan, a month of fasting. It is a phase in which all devout Muslims do penance and refuse from all desires. Over the entire month of fasting the religious are not allowed to eat and drink during daylight. Only at night time, they may ingest meals and beverages. Sick people, children up to puberty, pregnant women and travelers are exempted from the duty of fasting. However the sick and pregnant women are encouraged to catch up the missed fasts afterwards. Even traveler in a Muslim country are affected by the extent of Ramadan: During day time almost all restaurants are closed and it might be difficult to get something to eat. In respect to religious habitats eating and drinking should always take place behind closed doors. Scoffing a luxury meal in public is maybe not the best idea. If lucky, you can find a restaurant exclusively open to tourists during Ramadan. As soon as I am about to enter such a place, I am assailed by a guilty conscience. However, once inside, touched by the smell of delicious food, all my bad feelings disappear. With the beginning of Idul Fitri eating behind closed doors finally comes to an end. 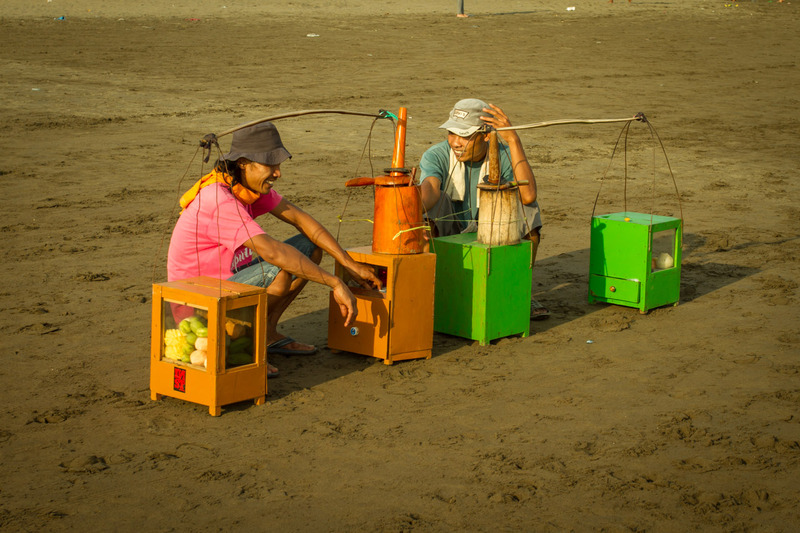 There are street vendors on each corner offering all kinds of food. We were aware that the end of Ramadan is something very special for Muslims. We just underestimated the extent of it and were surprised by an entire country going wild. 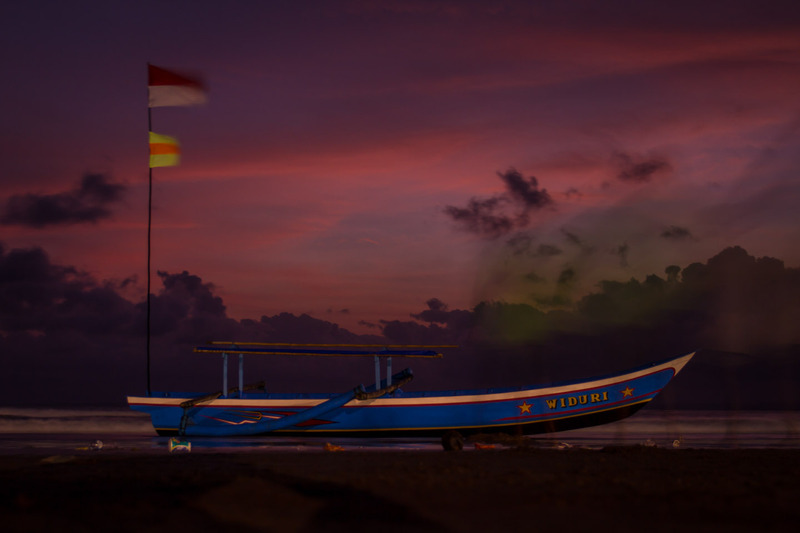 Pangandaran is basically a small quiet fishing village, an ideal location for relaxing on the beach. Not so at Idul Fitri. 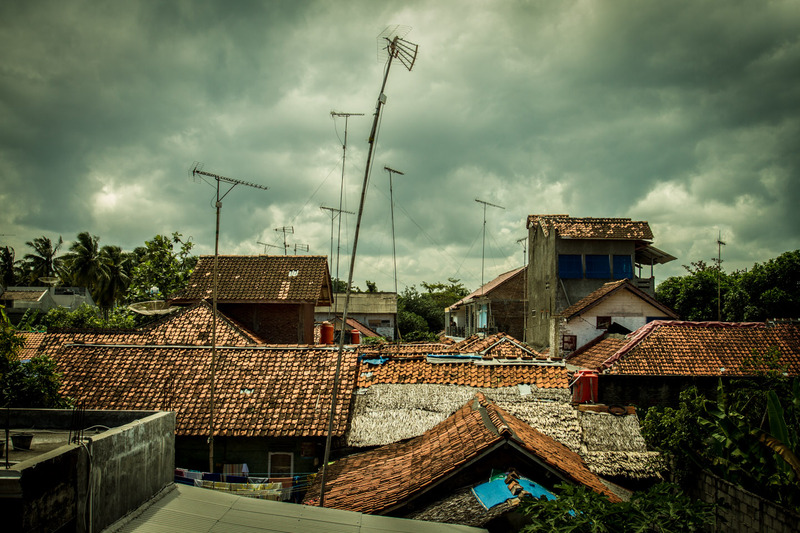 During that time it is one of the most popular holiday destinations for Javanese people. From one day to another Indonesian’s entire population showed up. At least that’s how it felt to us. Crowds were flooding the entire city, its buildings, streets and beaches without any end in sight. 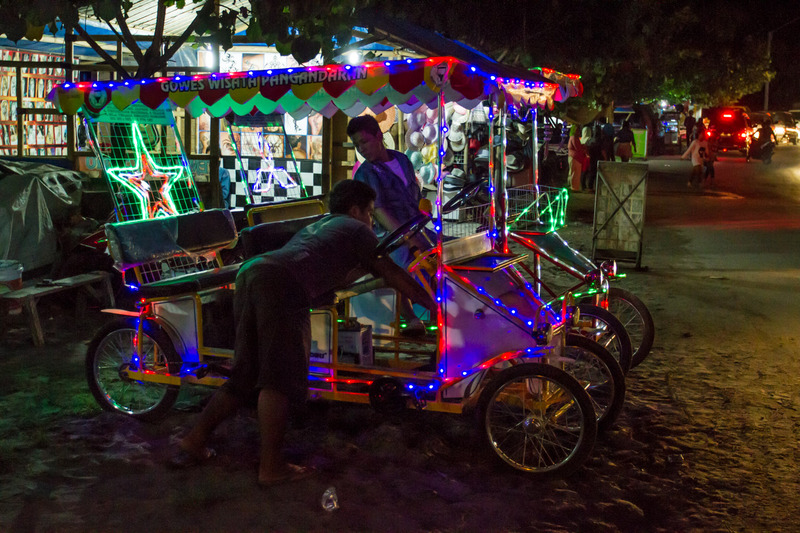 Whole Indonesia seemed to have taken off to celebrate the end of their fasts and they all made a pilgrimage to Pangandaran. The beaches, usually empty, were suddenly full. No, not just full, but full, full, full! Mixed within the holidaymakers were all kinds of flamboyant personalities dressed up in fancy clothes and costumes. Beaches and streets became their stage. The mainly conservative Muslims were delighted by the entertainment. The atmosphere was joyfull and relaxed.In fact this is something very special about Indonesia. In most regions of this country people respect the culture and religion of each other. Nico and I were some sort of attraction ourselves. Soon camera flashes were catching us as well. It was like a maelstrom, once we agreed to take a picture with a person, they all pulled out their camera or phone. At first it was fun but after more than a hundred photos taken it became quite exhausting. We briefly thought about turning it into a business, asking a euro a picture. I am sure we could have made a fortune. 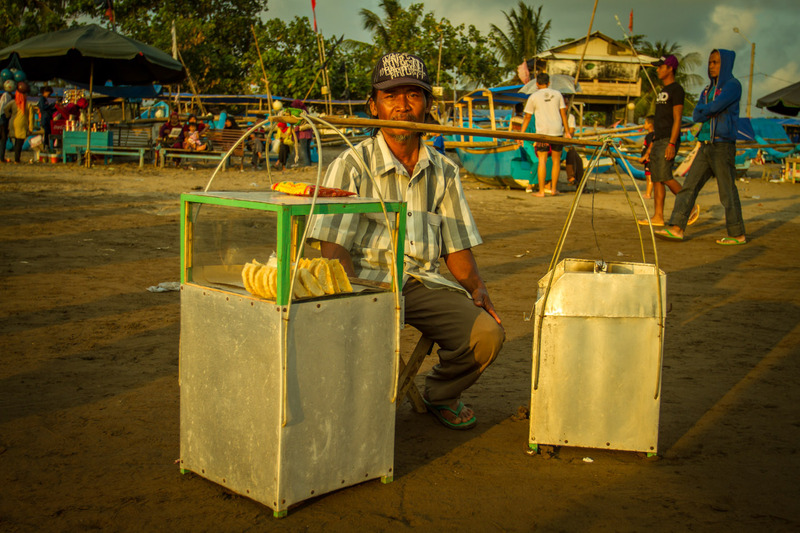 For Pangandaran’s economy Idul Fitri definitely is the time with the highest turnover. The streets are packed with vendors offering mainly cloth and food. 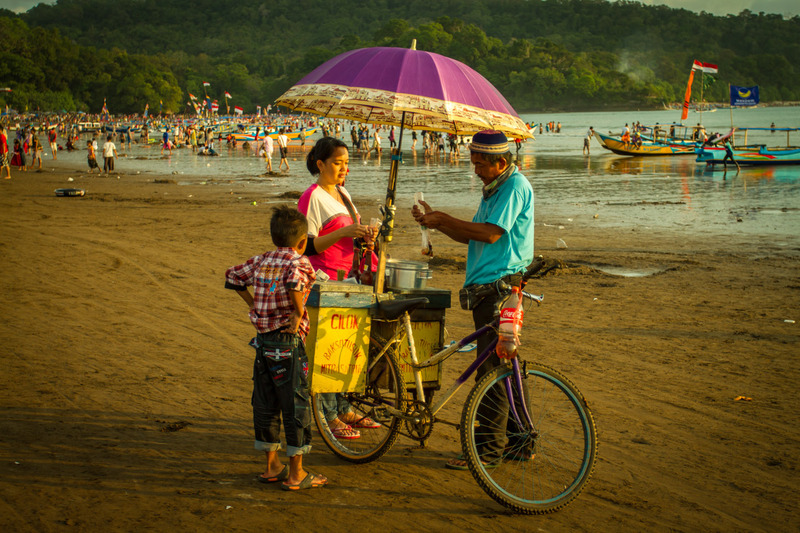 Even on the beach you can get everything from fresh fruits to fried food. 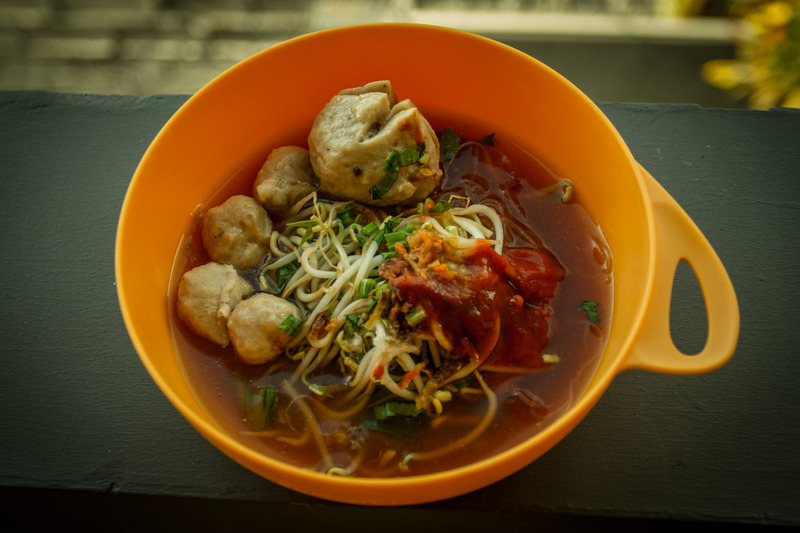 Mie Bakso, a traditional meatball soup, will set you back less than a euro and is something you don’t want to miss out on. Another type of business are boat trips to the national park on the southern peninsula. There’s a great number of traditional wooden boats in bright colors to choose from. The boatmen will either take you to the nearby White Beach right at the beginning of the park or further down the line, for a walk in the jungle. Both, the beach and the jungle can be reached by foot. It’s a long walk but worth the trip. Walking the entire way around the peninsula will take you a whole day. 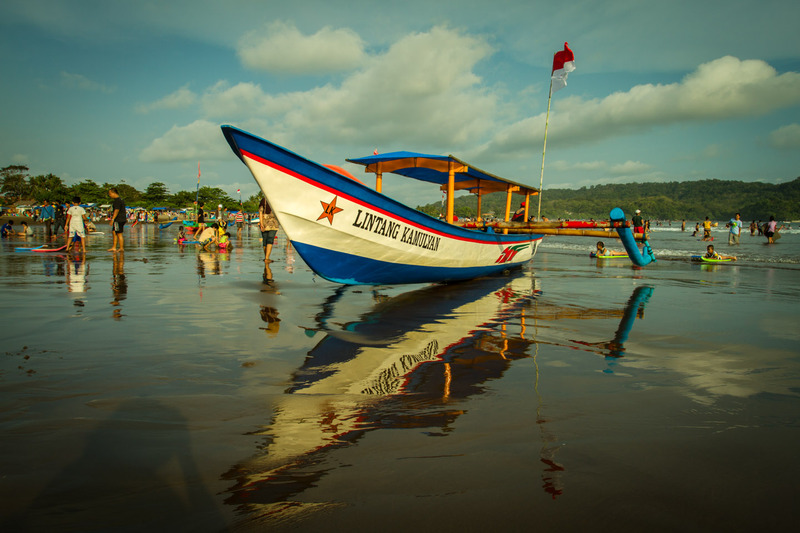 Pangandaran is a well known surfing destination. 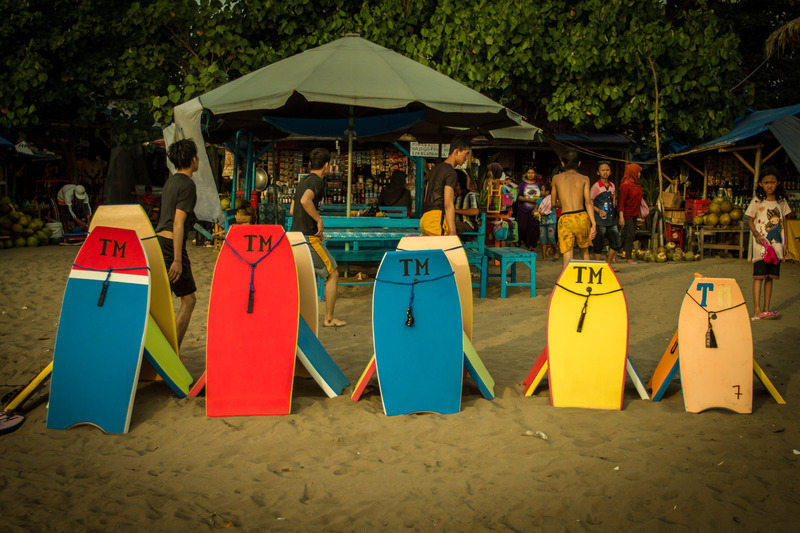 There are many surf- and bodyboards for rent on the beach. Beside the sandy beach breaks on the main shore there's a reef break in the national park and another beach spot in the nearby town of Batu Karas. 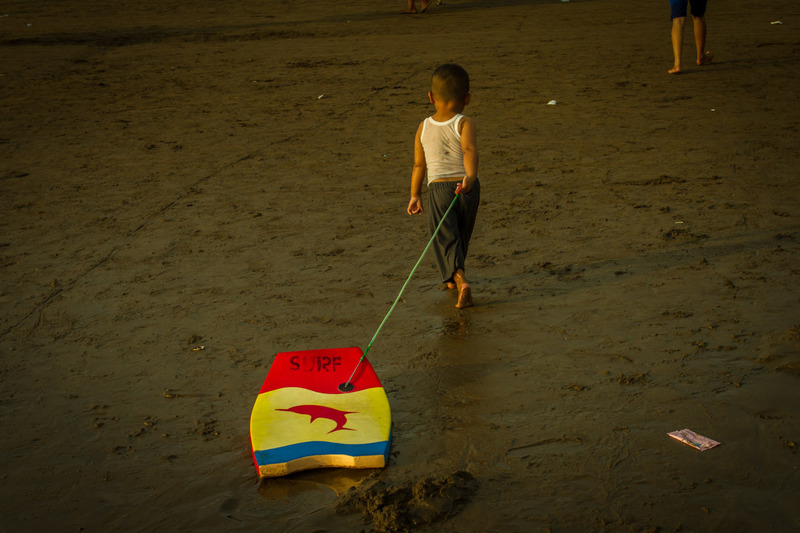 Surfing is not only popular among foreign tourists. Some locals love to play with the waves as well and have good skills. 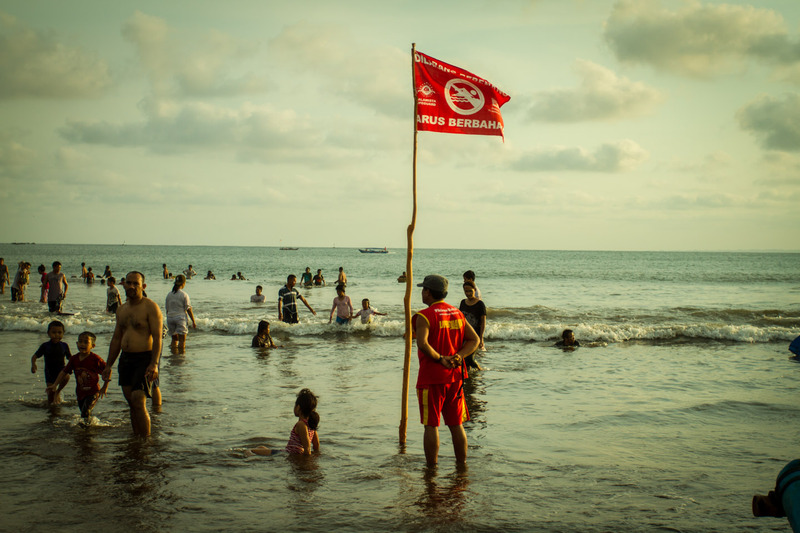 Despite that most Indonesians never learned to swim and prefer to splash in knee deep water. 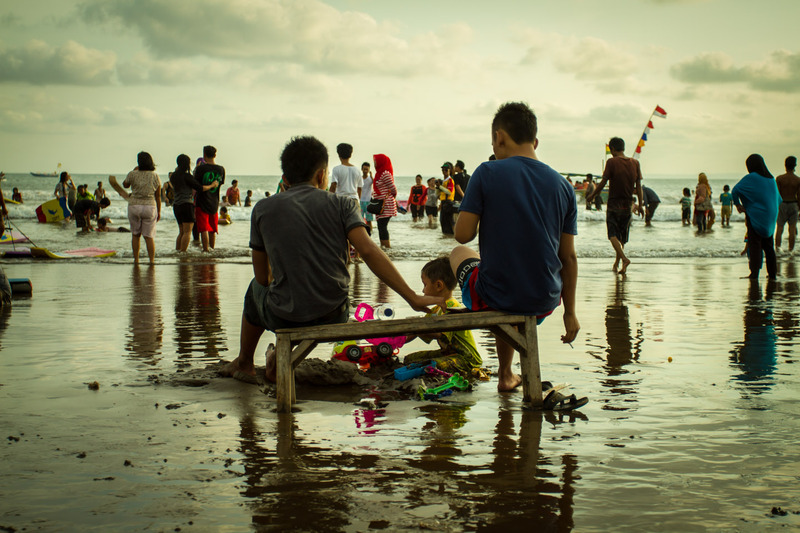 For many families Idul Fitri is the perfect time for a short trip to the sea. During the holiday most accommodation are fully booked and prices increase by four times. That's why a lot of people not only decide to spend the whole day a the beach, but also the night. 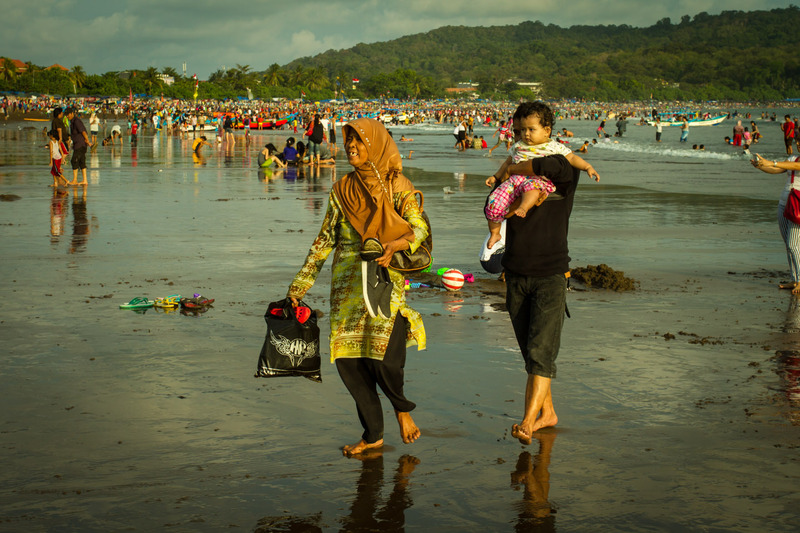 Due to Muslim customs most women wear long skirts and shirts while taking a bath in the ocean. Fewest own swim suits and use normal street cloth on the beach and in the water. At 6 pm the lifeguards kicked everyone out of the water. No joke. From that moment there was no surveillance and after just a few minutes the water was deserted. The beach party however was just about to begin. 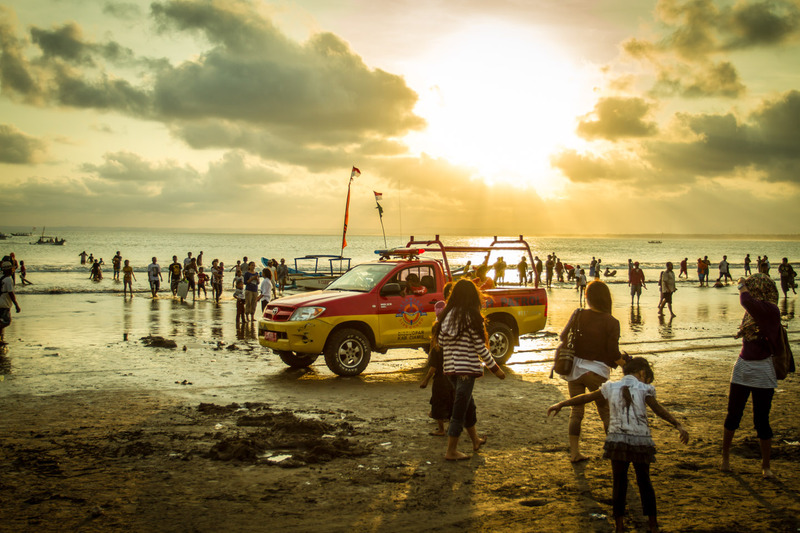 The sundown attracted the people from town and dragged them to the beach. Even if you already had dinner, there's always a little space for Pisang Goreng, deep fried banana. 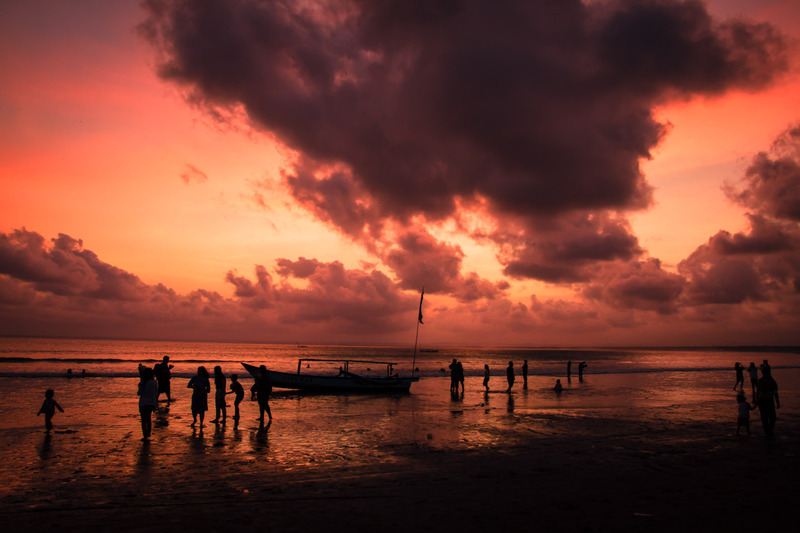 We had some of the most spectacular sunsets of our journey in Pangandaran. It was not only the gorgeous colors and impressive atmosphere, but also the playful life and joyful people on the beach that made this moment so special. However, after a few days of action we were really longing for the peace and silence we had been searching for in first place. Like we expected, public transports were still fully booked and we were stuck. It took a while and some efforts to escape the chaos but in a wondrous way we found heaven. But that’s a whole different story to be told. 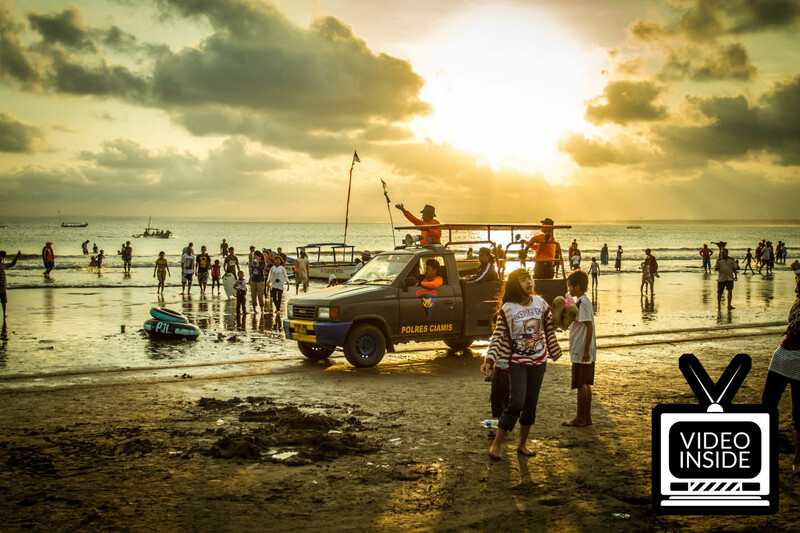 Watch out for our next blog entry: Nusa Kambangan (coming soon). 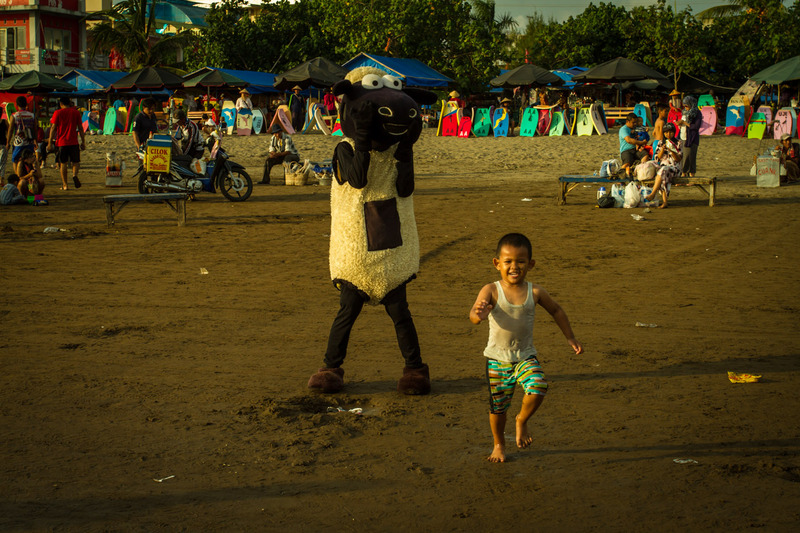 To give you a little impression how beach life in Pangandaran during Idul Fitri looks like, here's a short video. Feel free to share and embed our YouTube video. Keep in mind that watching and clicking the advertisings on our YouTube videos will help to support us.